The trading port of Lorient is located between Brest and the Loire river, on the south coast of Britanny. Lorient’ outer roads offer a 20 m depth waiting area sheltered by Groix island, allowing very large carriers to anchor safely. Crew change, provisions/ spare parts supply and underwater survey (water clearness) are frequently arranged on the area. Maneuvering time between anchorage area and the docks is quite short, about 1 hr. The deep sea port is accessible at night and day, 365 days a year. 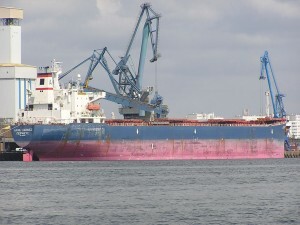 3 tugs of 20, 30 and 40 Mt bollard pull each are available to assist heavy loaded vessel’s berthing. Kergroise port is specialized in agri food dry bulks, achieving daily discharging rates of about 10 000 Mt per vessel. The port is fitted with 3 quick unloaders and 5 shore cranes, to feed 150 000 Mt warehousing capacity. Kergroise facilities also handle various cargoes, such as bulk cement, pig iron, China clay, shredded tyres, wood pulp, timber, scraps, seaweed sand, project cargoes, etc. Furthermore, dedicated terminals allow the discharging of clean petroleum products, molasses and RoRo traffic.